The Port of Oakland has announced the completion of a USD 67 mln waterfront expansion, as TraPac marine terminal opened its new berth for containerships. This marks the accomplishment of a 2-year project at Oakland’s second-largest terminal. As a result of the expansion, a third 1,400-foot-long (427m) berth was added to cater for mega container vessels, which allowed to nearly double TraPac’s area from 66 to 123 acres (up to 0.4 ha). Moreover, the fleet of STS cranes was increased from 4 to 7. Besides, last summer, TraPac opened a new gate complex for harbour truck drivers, as part of the terminal’s expansion, and purchased 9 new pieces of cargo-handling equipment to lift containers. TraPac’s development is the latest in a series of significant investments at the Port of Oakland. Last November, Lineage Logistics and Dreisbach Enterprises opened Cool Port Oakland, a USD 90 mln refrigerated distribution center. Last June, Oakland International Container Terminal completed a USD 14 mln project to heighten 4 cranes. TraPac also intends to raise two cranes. 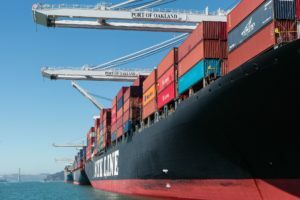 In 2018, the Port of Oakland’s container volume hit an all-time record figure, having handled 2.55 mln TEU. This throughout was 5.2% up from 2017 volume and marked the second straight year of record volume in Oakland. TraPac handles about 15% of the containerized cargo moving through Oakland. Much of it is refrigerated cargo destined for Japan, a major Oakland trading partner. TraPac said that during expansion, it increased plug-in spaces for storing refrigerated containers from 388 to 860. TraPac signed a 14-year-lease with the Port in 2016 as a precursor to its expansion.